There’s nothing better than eating a sun-ripened apple fresh from the tree or a fat juicy plum that still has its silvery bloom. But what to do when you have too much? 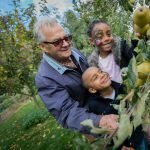 In a good year, even after the neighbourhood kids have been scrumping and you’ve given fruit away to your friends and family, you might still have more than you can eat. If you have the space, store some fruit for eating fresh in the winter – some late-ripening apples and pears will keep for months if stored correctly. Wrap each fruit in black and white newspaper and store in shallow cardboard boxes or on open-slatted shelves in a cool, dark place. Apple chutney, pear and ginger marmalade, plum jam, medlar ‘cheese’, quince paste, apple jelly – most fruit can be preserved and will keep for at least 12 months in the right conditions. Cider is a great way to use all those windfall apples – the natural yeasts that grow on the fruit will help the fermentation process along…and if it doesn’t come out quite right, you can always make some apple cider vinegar. If you’re feeling a cold coming on, some Rowanberry Winter Remedy might help. It’s an acquired taste but super high in vitamin C.
And for a more enticing liquid tonic, almost any fruit can be used to flavour to your evening tipple – Sloe Gin, Damson Vodka or almost anything else. Spoon the mixture into the cases and cook for 20 minutes in the middle of the oven. Top out and cool. Rosehips are one of the richest plant sources of vitamin C, nearly twice the amount found in oranges. The government even encouraged people to forage for them in WW2 to supplement children’s vitamin intakes as there was a national citrus shortage. Happily, they grow wild in many hedges and green spaces and are easy to indentify due to their distinctive red colour. Strain the mixture through a colander balanced over a bowl lined with a clean tea towel (note – it will never be clean again, they stain! Medlars, Mespilus germanica, are one of our forgotten fruits. The trees originate from the western Mediterranean and were grown widely by the ancient Greeks and Romans. The fruits were again popular in the Victorian era when they would be served with cheese as a membrillo-style paste set in decorative moulds. The fruit is hard and acidic if picked too early and must be bletted – a process of softening (or rotting) that will happen naturally on the tree after the first frosts or in fruit stored in a cool place after harvesting. Wait till the fruit has gone soft and mushy – you can then eat it straight away or use in baking and preserves. We made medlar jam following this recipe and it was delicious! Wash the fruit – there’s no need to cut them up. Quarter the lemons and put the medlars, lemons, cinnamon and water into a pan. Bring to the boil. Simmer gently until the fruit is soft. To help them along, you can use a potato masher to crush them up. Rub the fruit through a sieve into a clean bowl – this will take some time and elbow grease! Clean the jam pan, put the puree back in with the sugar and vanilla and slowly bring to the boil, then simmer gently until reduced by about half. Transfer jam to sterilised jars, leaving a small space at the top. We made two batches with different consistencies – one was set firm as a perfect accompaniment on a cheese board and the other made a delicious breakfast preserve. The difference seemed to be in the boiling point, so do experiment. Peel, core and chop the apples and pears. Place in a saucepan with a pinch of salt and just enough water to cover the base of the pan. Cook covered for 10 minutes or until soft. Let any excess liquid evaporate with the lid off. Mash with a fork and put aside. Boil the raisins with ½ cups of water, a pinch of salt and the vanilla pod cut in half and with a slit lengthwise for 10 minutes. Add some natural sweetener to taste, the vanilla scraped from the pod with a knife (discard the pod itself), lemon rind and another cup of cold water. Immediately sprinkle in the polenta, briskly stirring with a wooden spoon to avoid lumps. Cook while continuing to stir until thick and creamy. Transfer the polenta to single serving dishes of your choice, filling them halfway. Spoon the fruit onto the polenta base. Roughly chop the walnuts. Gently warm up 2 tbsp of syrup in a small saucepan. Let it bubble away until it is thick and gives off a caramel aroma. Add the walnuts and cinnamon and mix well. Spoon onto the fruit as the topping. Begin by toasting the hazelnuts over a medium-high heat for around 10 minutes. Stir frequently to avoid burning and once the skins start to peel away, remove from the heat. Rub the hazlenuts between a folded, clean tea towel to remove most of the skins and finely chop or quickly blitz in a food processor. In a large mixing bowl stir together the flour, baking powder and sugar. Add in the solidified coconut oil (chill in the fridge if required) and rub the oil into the flour using your fingertips to create fine breadcrumbs. Stir in the chopped hazelnuts then add in the milk a little at a time until the mixture starts to hold together. Press around half to two-thirds of the pastry mixture in the base of a greased 18cm springform tin or flan dish to form the base. Cover the remaining mixture and pop in the fridge briefly whilst you prepare the plums. Stir all the filing ingredients together and pour onto the pastry base. Remove the remaining pastry mixture from the fridge, break the mixture into crumbs using your fingertips and stir in the oats. Finally pour the crumbly topping over the plums and bake at 195C for 45-50 mins. Check at around 30 mins and if already nicely golden, cover with foil for the remaining time.